A quick hello from us at the Table! Missed you guys! I have been going through a lot of changes around here the last couple of months and am REALLY looking forward to everything settling down in the next couple of weeks! (more on that to come) I hope you are all enjoying your summer , and I am looking forward to sharing all our exciting new stuff! Until then, another easy meal for you guys to try. As always, let me know if you try it and what you thought! 1 package corn muffin mix (and any ingredients listed on it) for this recipe I used 1 box Jiffy mix. Cook chicken all the way through. Add ¾ cup water and 1 packet of taco seasoning to chicken. While the seasoning is thickening, break up the chicken into small pieces using a wooden spoon. Mix cornbread mix in a small bowl, set aside. In Medium sized casserole dish, layer chicken in sauce across the bottom. The next layer will be the black beans, then corn. Pour cornbread over the top, smooth with spatula. Bake until cornbread is done all the way through. This will take about 35 minutes. Here at the table people are dropping like flies. Life is a little sad when you come home from the doctor and say, “Great news! It’s not strep.” And mean it. It is a fever of about 103, stuffy nose, achy body, sore throat, general ugh. We are calling it September Crud. We are all passing it back and forth (sharing is caring and all that) despite the constant Lysoling and bleaching of every GD thing in the house. Sorry I have had this for about a week on top of that whole dental issue I mentioned before, and now I’m bitter. So I have actually been doing a lot of easy to prepare comfort meals this past week and thought I’d share some with you. First I’ll need to introduce you to my bestie in the kitchen. My Crockpot. She’s awesome, I get her going in the morning and she just cooks away all day while I’m at work, hot meal ready when I get home. I actually own 3 Crockpots (each is a different size) but the one I like best was a gift from my former mother-in-law (awesome lady btw). It is a Crockpot with a removable cooking bowl, which means easier cleaning and dishwasher safe! I try to avoid not dishwasher safe stuff in the same manner I avoid dry-clean-only clothes. Now the removable cooking bowl is actually 3 bowls. So this one Crockpot can be a 2 quart, a 4 quart, and a 6 quart, depending on what I am cooking, very cool. She not only has the traditional high/low/off settings, there is a setting for each sized bowl and a warm setting, which is nice for buffet style serving. 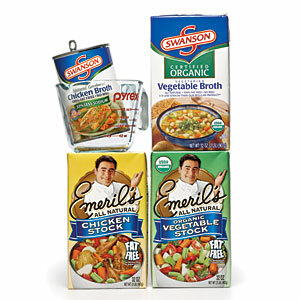 Now that you’ve been introduced, I will give you directions for making Crockpot Chicken Noodle Soup. (Cause that’s the first thing I think to cook when people are sick) Who doesn’t, though, right? Dice into tiny pieces celery and onion then toss in the Crockpot. Cut each baby carrot into thirds and add to Crockpot. Dice chicken breasts and add to Crockpot. Fill broth box 1/2 full with water, add to Crockpot. Sprinkle enough paprika to thinly cover top of broth. Place 2 tablespoons of rosemary either in palm of hand or in mortar and pestle. Crush (to break it down & release flavor better) before adding to Crockpot. Set on low cooking setting with the lid on. Then leave alone. Stir so that noodles are fully submerged. Replace lid and turn setting to high. 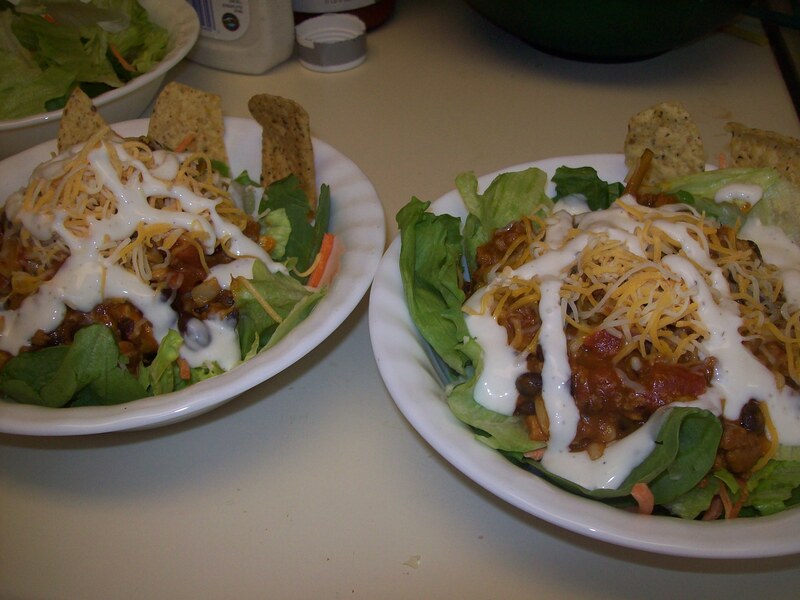 Here we get to eat taco salad (without the fried basket) and use leftovers! This is great for using up whatever taco-seasoned meat you have leftover from your last taco night. As you have discovered our Tex-Mex loving ways already, I’m sure you have guessed that having taco/burrito leftovers in our fridge is like having leftover Mac-n-Cheese or that 1 random leftover hot dog. This salad works with chicken, steak (not that I have ever put steak in a taco at home, but if I did it would be fine here), or ground beef. 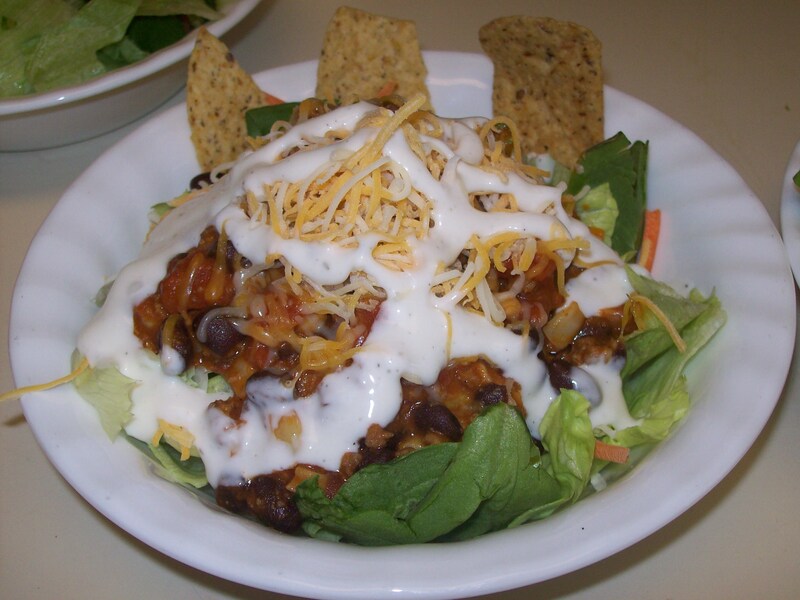 You can completely leave off the meat and substitute out about 1/8 cup refried beans per salad if you prefer. You can use the chicken burrito filler from before, if you want, just leave out the duplicate ingredients. You can also use the plain baked chicken, for people who are less loving of all things Tex-Mex. Allow this mixture to simmer until it resembles a chunky sauce, then remove immediately from heat. Let it cool to a warm, but not hot temperature (sauce will thicken considerably). Portion out Base Salad into bowls. With serving spoon or ladle pour about 1/2 to 3/4 cup of mix on top of each base salad. Sprinkle with Colby and Jack cheese shreds. You can add ranch or Sour Cream on top of this for those who feel they need dressing, but this is actually quite good as is. “Garnish” with 3 or 4 wheat tortilla chips in side of bowl. Tostidos makes really great ones now. Depending on how many you have eating, you will probably have leftovers. If you keep plain brown rice in your fridge, you can mix a little with this topping to thicken it enough to put in a tortilla for lunch if you like. Another idea is as a snack/party food/whatever you can add this topping to chips spread on a plate for some pretty awesome nachos!